If you are the type who enjoys tropical islands with white powdery sand merging into the jungle on one side and then disappearing into the turquoise clear blue ocean on the other, then this is the spot for you! And the great thing is, you can choose between any of the 7,107 islands in the Philippines. Philippines beaches provide deep-blue, crystal-clear waters encompassing about 40,000 square kilometers of coastal reefs abundantly filled with a large variety of marine life. The months of March to May constitute summer in the Philippines. Although, the tropical weather makes it seem like summer year around! The Philippine islands are famed for their extended coastline, ringed with magnificent beaches and everything from budget hostels to high-end resort facilities. The primary draw of the Philippines are its world-famous Philippines beaches: Puerto Galera, Boracay, Palawan, Bohol, and Cebu are the most popular. From Manila, on Luzon Island, you need to take a bus to the Port of Batangas which takes approximately 3 hours, depending on the time of day and which day it is, it can take as long as 5 to 6 hours. From Batangas, which is south of the Philippine capital of Manila, you'll be able to catch a ferry across to Puerto Galera, which is about an hour to an hour and half ferry trip. The bus ride to Batangas is quite uneventful, the real beauty starts when you get on the ferry going to Puerto Galera. The water is a deep cobalt blue, if you are lucky you may see dolphins, turtles and flying fish. Sabang beach and White Beach in Puerto Galera are the 2 main resort and beach areas for the traveler to explore. There are a wide range of accommodations available, with many Puerto Galera hotels and resorts lining the beach-front, a variety of restaurants to choose from, and crystalline white sand to sink your toes into! Also, don't miss out on the superb snorkeling and scuba diving opportunities just off the coast. Boracay Island in Kalibo, Aklan within the Philippines has become one of the favorite tourist and vacation destination spots in Asia within the last few years. In terms of Philippines beaches, Boracay is considered one of the best. 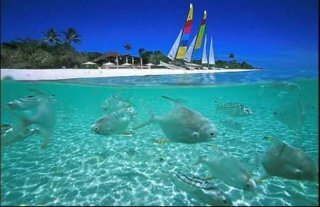 Over the years Boracay has developed into a destination for a number of water sports as well as other recreational activities that have been added to the beach experience. Having a great time at the beach in Boracay can include parasailing, jet-skiing, wakeboarding, beach volleyball, windsurfing, island hopping, banana boat rides, and fly fish rides. If you need to reach that ultimate state of relaxation, there are plenty of Boracay hotels and Boracay spas to choose among. Whether you're on a budget or willing to spoil yourself, you can definitely find the spa which will soothe your mind and body in Boracay. Palawan is considered to be one of the last frontiers in the Philippines. It is a bit remote, you will have to fly into the capital of Puerto Princessa, but well worth the effort to get there. One of the most amazing coral reefs in the world, Tubbataha Reef & Marine Park, a UNESCO World Heritage Site, is located just off of the coast of Palawan. Very well-known by scuba divers and marine life photographers for its tremendous range of colorful and sometimes quite abnormal looking fish, marine creatures and plant life. Coron, Palawan, which boasts of one of the most famous wreck diving spots within the country and Asia, is the location of a number of Philippines beaches, Palawan resorts and vacation rentals offering wooden cottages and secluded villas for the intrepid traveler. On Coron Island, visitors can try a night or two living like a true "survivor." Also in Palawan, El Nido Marine Reserve occupies 96,000 hectares and features a number of ecosystems which include rainforest, mangroves, white sand beaches, coral reefs, and limestone cliffs.